In December, 1981, the famed HIGHLIGHTS OF JAZZ, now the longest running concert series in New York, paid tribute to the great trumpeter Doc Cheatham! The salute to Doc Cheatham was a gala presentation including such famous musicians as Vic Dickenson and Budd Johnson, and of course Cheatham himself. 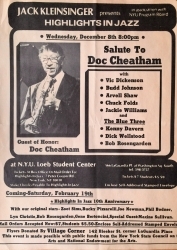 This flyer from the event features Doc Cheatham prominently and lists the other artists who performed with him that night.